Fantastic home in the extremely desirable community of Countrywalk overlooking a pond and conservation area. Freshly painted in 2016, this stunning 2 story, 5 bedroom 3 bath home is priced to sell fast! Spacious enough for the largest families in a phenomenal neighborhood, demand is sure to be high. This home immediately impresses with curb appeal and beautiful landscaping. Spacious and welcoming, The first floor includes an open kitchen with granite countertops, 42″ wood cabinets and stainless steel appliances. The breakfast nook has a relaxing view overlooking the pond that is sure to draw your attention. In addition to the formal Living and Dining areas, You’ll find an in-law suite off the kitchen that is perfect for overnight or long-term guest. A spacious screened in back porch with a wrought iron fenced back yard is perfect for relaxing. Upstairs you will find 4 bedrooms (including the Master), 2 full bathrooms and an additional family room spacious enough for the family or a pool table! The massive master suite features tray ceilings, a wonderful walk-in closet and a large master bath with dual vanities, garden tub and a walk-in glass shower. Begin your Paradise Life today in this resort style community complete with a pool, tennis courts, basketball courts, fitness center, dog park, playground, club house, and even a soccer field! Conveniently Located to I-75, restaurants, schools, Shops at Wiregrass, and the new Tampa Premium Outlets. HOME WARRANTY INCLUDED!! 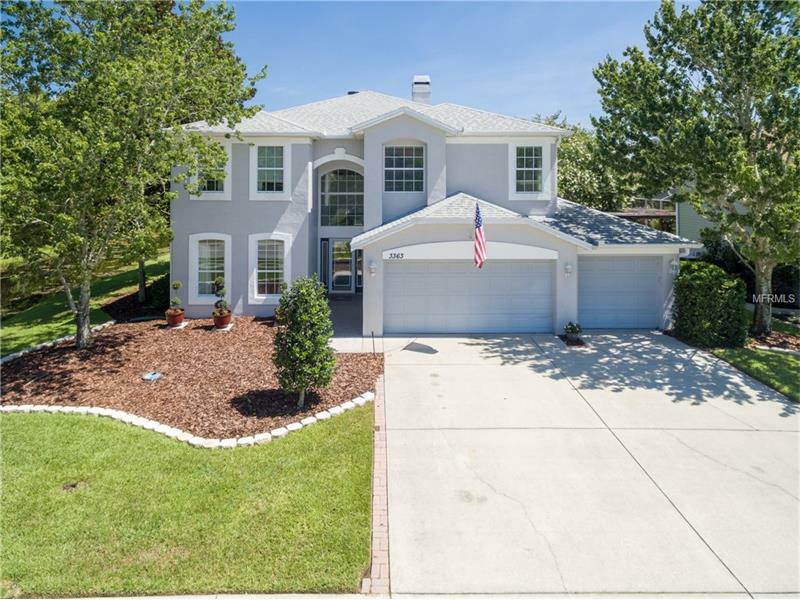 MOVE-IN READY CUSTOM BUILT HOME in EAST LAKE! This pool home is extremely well-maintained & has a pond on 2 sides. Incredible views from Kitchen, Living room & Master Bedroom. Home features high ceilings, lots of fans & plenty of natural light; 5 SPACIOUS bedrooms w/ LARGE WALK-IN CLOSETS; new in 2016 high-end stainless steel appliances in bright, comfortable kitchen with 42″ solid wood cabinets & large pantry; Large eat-in overlooks heated sport pool; crown molding throughout the downstairs; tall doors w/ built-in blinds open to pool area from family room; updated flooring & lights; custom opaque hurricane panels, generator & reinforced door in 3-car garage. Very smart layout allows room to roam & plenty of private space. Master Bedroom has convenient spacious sitting area with built-ins for home office or extra storage. 5th bedroom on ground floor can be an in-law suite. Upstairs bonus room can be enjoyed for media or games & includes 2 large closets. Built with all the best features to keep energy bills low for such a large home including beautifully trimmed ALL DOUBLE PANE WINDOWS & real wood burning fireplace (w/ gas pipe ready for conversion). Tons of storage & built-ins, home shows extremely well & is perfect for entertaining & large dinner parties. With great schools this peaceful, private & serene home is the real deal in the East Lake corridor! Tuscany At Innisbrook!!! Hurry!!! Double Master, 2 bedroom 2 bath split plan condo. Crown molding & volume ceilings make this ground floor condo a must see. Computer nook with open floor plan & inside utility. It is just a few steps from the tennis courts and condominium amenities. Located at the end of Portofino…it boasts of privacy with no rear neighbors and a wooded view. Nothing compares to this resort lifestyle community providing an elegant clubhouse, fitness center, 2 heated swimming pools, tennis, gated security and more located within minutes to beaches, golfing, bike trail.